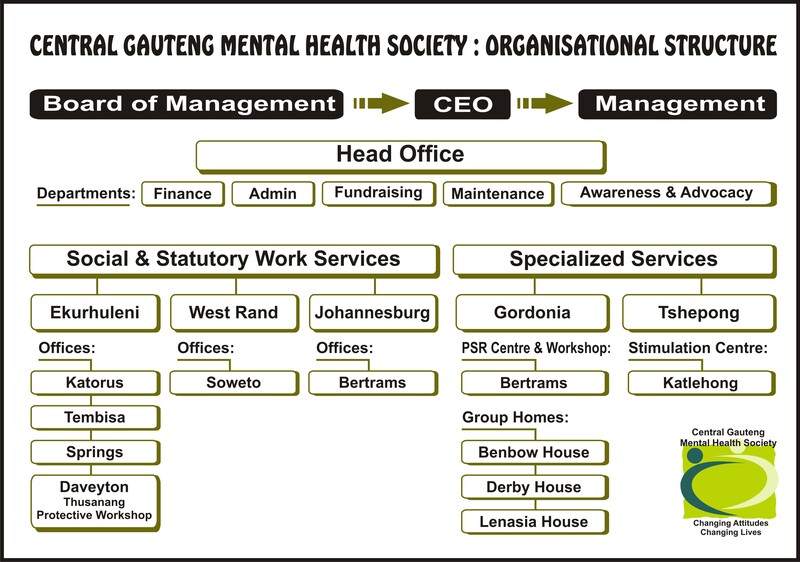 Who is Central Gauteng Mental Health Society? Disability, Health, Mental Health, Community Development, Empowerment, Advocacy, Skills Development, Human Rights, HIV/Aids and Mental Illness, Arts and Culture, Women and Children, Orphaned and Vulnerable Children. Advocate to improve mental health care services. To improve the knowledge of the general community and health professionals and encourage accurate and responsible reporting of mental illness in the media. To provide services including accommodation, income generation, vocational and self development opportunities, support networks, social services and recreational opportunities. To lobby for access to improved mental health care services, the most effective treatment and improved continuity of care. To facilitate self-advocacy and empowerment of persons with mental disability. Central Gauteng Mental Health Society, formerly known as the Witwatersrand Mental Health Society, was born on 23 November 1919 as the Society for Mental Hygiene and Care of the Feebleminded, with statistics of 100 cases of mental deficiency recorded. The Society managed to branch out into new activities such as an occupational centre for boys in Johannesburg in 1941 and a home for indigent women in 1942. Over the years the organisation never ceased to agitate for more accommodation for the mentally disordered and defective in Government institutions and to urge the Government to provide accommodation for non-white defectives. The late 1960’s and 1970’s brought with it an emergence of the need for a multi-disciplinary approach, as well as a call for the specialised skills of professionals within the mental health field. The biggest challenge of the late 1980’s saw a rejected notion of privatisation of welfare services and affirmed the principles of a single welfare system with equitable distribution of resources made available to all who need it. The primary goal back then was the promotion of a mentally healthy society. To that end, the approach to service delivery was guided by a belief in the ability of all humans to realise their full potential, if given the correct learning environment in which to do so. One of the greatest achievements of the Society over the decades is the fact that many established organisations and facilities for the mentally ill and intellectually disabled owe their existence to the Society. Today the global use of terminology like: “mentally disordered” and “defectives” are perceived as discriminatory and promoting stigma and discrimination. The use of terminology currently preferred to describe persons with mental disabilities, include: “person with a mental disability or psychiatric or intellectual disability”, “person with a mental illness”, “mental health care user”. The organization has been playing an integral part in providing direct services to children, families and communities in distress. 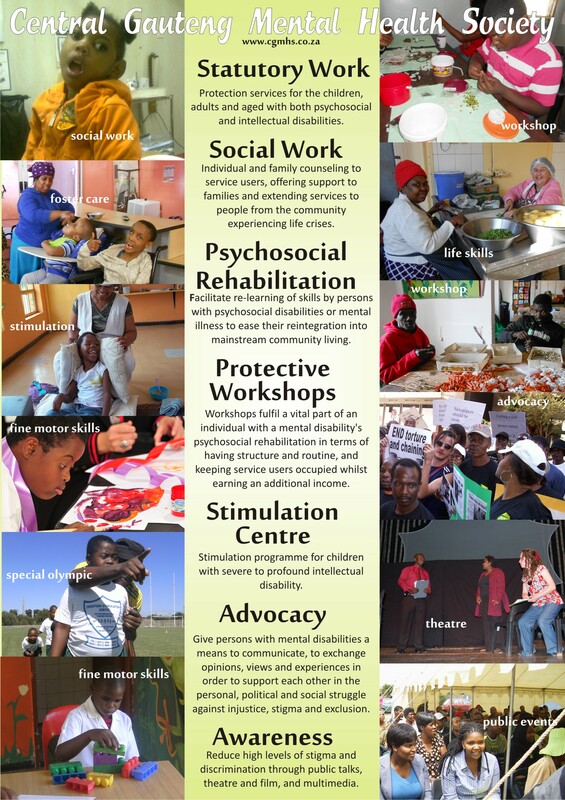 The Society operates in the Greater Johannesburg area and we have offices in Johannesburg, Ekurhuleni and Soweto. Our beneficiaries include children who have been exposed to abuse sexually, physically and emotionally, abandoned, neglected, missing or lost, including those who are vulnerable, orphans and those affected/infected by HIV/Aids. The Society relies on a dedicated and professional team to render this service to provide an essential and an important care and support service to those who are in dire need for any kind of assistance.